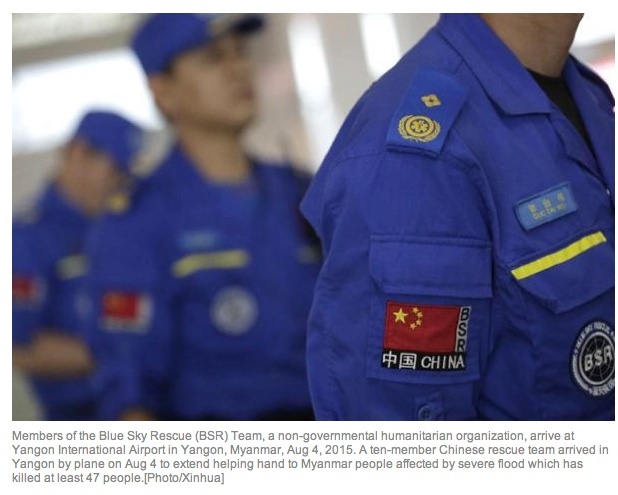 A Chinese relief mission has visited the flood-hit state of Rakhine in western Myanmar. Led by Chinese Ambassador Hong Liang, it is one of the first batches of international relief teams to bring food and water to the victims. “We come here for rescuing disaster-affected people for the first time as we are neighboring countries and have friendly relationship between the two countries,” Zhang said. The second and third batches of rescue teams are standing ready to provide assistance to flood hit areas if needed after the first team met with the concerned governmental department and observed the current situation there. 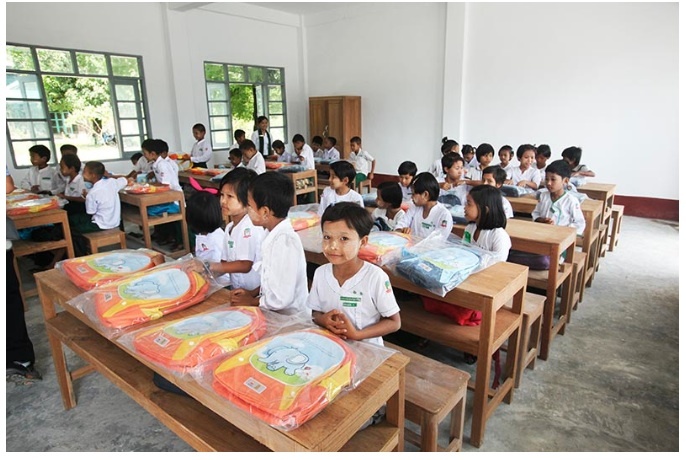 Meanwhile, the rescue mission led by Chinese Ambassador to Myanmar Hong Liang handed the second batch of donation for 20, 000 families in Sittway, Myanmar’s western Rakhine State on Aug 4 after the first one for 1,545 families in Kalay township in Sagaing Region on Aug 3. 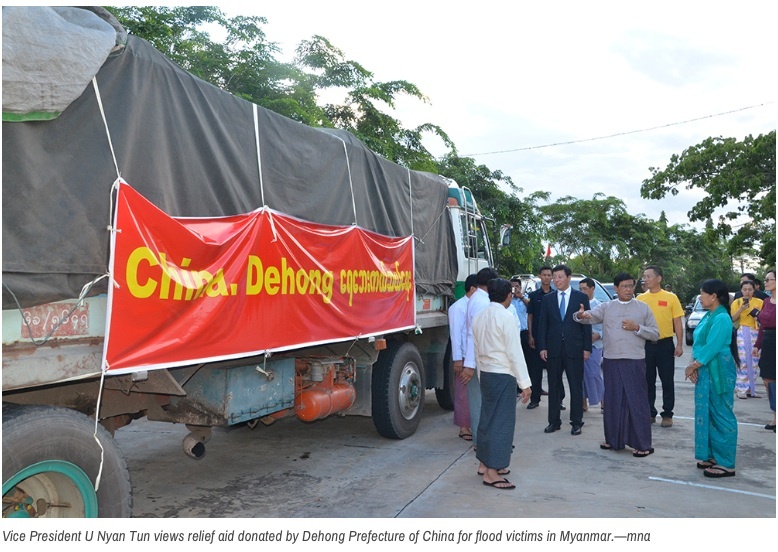 Another Chinese group will be dispatched to carry on rescue mission in central Magway Region within the same week and a special family rescue package was designed to provide the flood- stricken people with daily necessities. 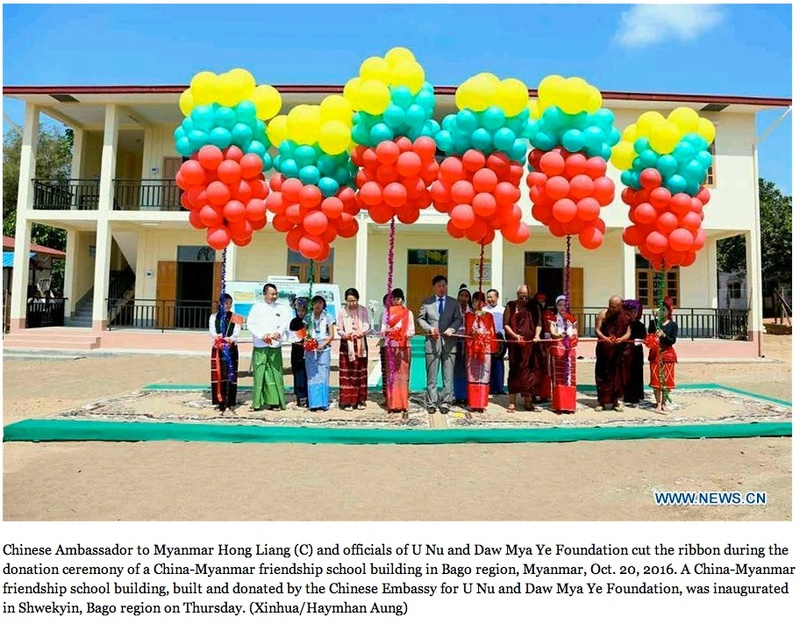 The total fund of the program for Rakhine State as well as Sagaing and Magway regions summed up to about $300,000. 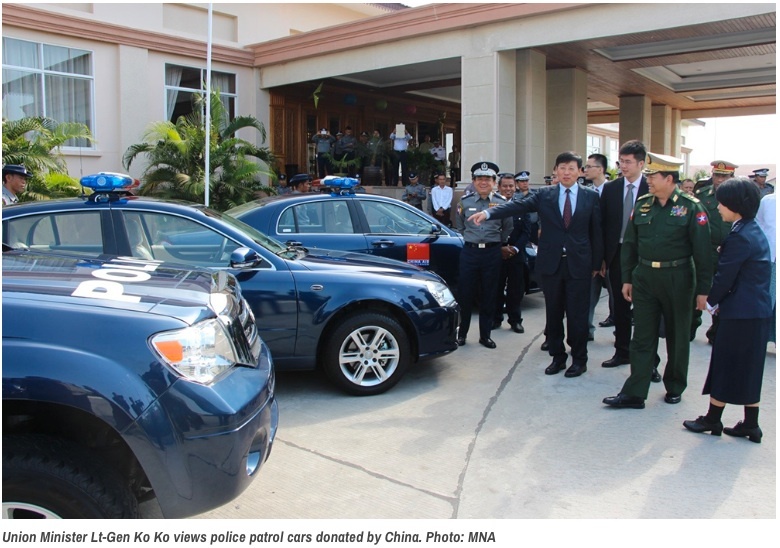 THE People’s Republic of China donated police patrol cars to Myanmar in Nay Pyi Taw yesterday with Union Minister for Home Affairs and for Immigration and Population Lt-Gen Ko Ko in attendance. Chief of Myanmar Police Force Police Maj-Gen Zaw Win and Chinese Ambassador Mr Hong Liang signed the agreement on the handover of the cars. During Chinese Premier Mr Li Keqiang’s visit to Myanmar in 2014 he pledged to provide police patrol cars at a future date. So far China has donated over 245 pickups, 135 trucks, 120 saloon cars and five dump trucks, totaling 505 vehicles altogether worth 99 million yuan (US$ 15.483 million). Thousands of residents in South Sudan’s northwest received a most welcome treat. A Chinese medical team recently pitched camp in the town and offered free clinics in the town which is currently suffering a shortage of facilities and medical supplies. Here’s Leslie Mirungu with more…..
China’s first medical team dispatched to earthquake-hit Nepal left Chengdu, southwest China’s Sichuan Province on Monday morning to participate in medical aid in Nepal for 10 days. The members of the 58-people team are from health departments including the provincial health and family planning commission, People’s Hospital of Sichuan Province and Huaxi Hospital of Sichuan Province. They were trained under 4,000-meter high plateau environments, say authorities. 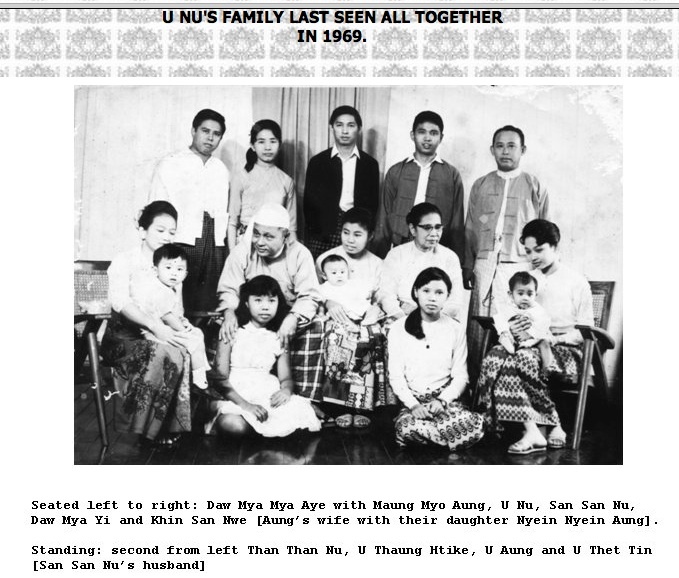 “This is the first team that the Chinese government organized. It is also the largest team with staff that cover all aspects of medical needs,” said Deng Shaoping, deputy leader of China’s medical team. Besides professional and experienced medical staff, the team is also equipped with special vehicles, hyperbaric oxygen chambers and mobile hospital equipment that can acclimatize to the plateau terrain in Nepal. “At present, we plan to go to Kathmandu where the altitude is not that high. But we may transfer to mountainous and plateau areas depending on the needs of the injured,” said Deng. The Chinese government has pledged to provide $3.3 million in humanitarian aid to Nepal, according to the Ministry of Commerce on Sunday. It has already sent a 62-strong China International Search and Rescue Team to carry out humanitarian mission following a massive 8.1-magnitude quake rocked Nepal on Saturday. Three helicopters and a medical team from the Chinese People’s Liberation Army (PLA) continued aid efforts in the quake-hit Nepal on Thursday. China on Wednesday dispatched three army helicopters to aid earthquake-ravaged Nepal. Their missions to help with local transportation and rescue will continue for days, according to the PLA’s Chengdu Military Area Command, which provided the three helicopters. As of Thursday morning, the military helicopters had transferred more than 300 quake victims and brought nine tons of relief goods to the local Nepalese. A total of 360 tons of relief materials are due to be sent to Nepal within four days. 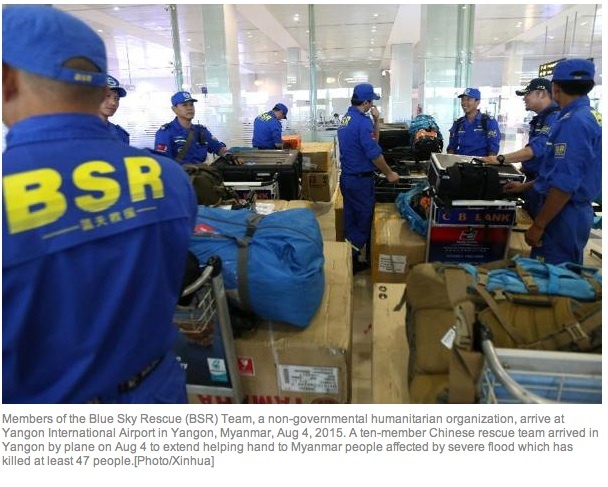 The PLA medical team continued rescue and disinfection operations in Kathmandu on Thursday. Each member of the disinfection team carried a 15-kg sprayer on back, went into narrow streets, and conducted epidemic prevention. So far the team has disinfected 68,000 square meters in Kathmandu, and tested over 50 water and food samples. A toal of 160 armed police officiers and 56 engineering machineries entered Nepal from southwest China’s Tibet Autonomous Region on Sunday to aid earthquake relief there. Their first mission is to reopen the road section connecting China’s border pass of Zham and Kathmandu, the Nepalese capital. After decades of civil war, the Democratic Republic of Congo is still riddled with landmines. Now Chinese engineers as part of the United Nations peacekeeping mission are working to clear parts of South Kivu province to continue building roads. In the final part of our special series from eastern DRC. CCTV’s Clementine Logan joined them on a mine sweeping exercise. A Chinese firm carrying out the construction of Nigeria’s first standard gauge railway line has started training for local railway personnel to prepare them for the operation of the rail as the project nears completion. Every year China sends a medical team to Ethiopia to assist in the health sector.The medical relationship has existed for over 40 years now. For the individual doctors who accept the task, it is big sacrifice that they confess is worth taking. CGNT’s Coletta Wanjohi reports. China on Wednesday officially handed over the first batch of 100,000 bags of relief food to Kenya for distribution to hunger-stricken citizens.Speaking during the handover ceremony in Nairobi, Chinese Ambassador to Kenya Liu Xianfa said the consignment of rice is part of the 450,000 bags that Beijing pledged as food aid. China’s ambassador to Kenya, Liu Xianfa, has officially handed over a modern research centre to the Jomo Kenyatta University of Agriculture and Technology. The project, funded by the Chinese government, cost nearly 30 million dollars. Let’s take a look. Zimbabwe’s moves to increase trade and economic links with China has led to a significant increase in Chinese imported auto sales over the past six months. The rising popularity of Chinese vehicles has seen them overtake more established international brands. Chinese massive investments in Africa have helped create millions of jobs in the continent, accordingly ranking china as number one biggest foreign job creator in Africa. The government of Mali has entered a US$11bn-worth contract with Chinese companies to help in boosting Mali’s economy and service delivery to its citizens. The signing, which was apprehended in Tianjin, China during the World economy forum, will see the country upgrade the already existing railway linking Mali to Senegal. The railway construction project, which begins in a year’s time, will be undertaken by two Chinese civil engineering companies namely China Railway Engineering Corporation and China Railway Construction Corporation. The two companies now have one year to submit detailed proposals to see Chinese banks fund the projects in the involved countries. In details, the railway project will involve the upgrading of the existing 1230km meter-gauge line from Dakar – the capital of Senegal – to Bamako in Mali, a project estimated to cost US$1.5bn. This railway construction will be rehabilitated by the china Railway construction corporation. Workers on Tuesday started building piers for a bridge in Yuanjiang County of southwest China’s Yunnan Province, which is a big step in the construction of a railway that connects China with Laos. The Yuanjiang Bridge spans over the Yuanjiang River. Once completed, trains will be able to travel from Yunnan’s Yuxi City to Mohan City before entering Laos. It is designed to be 832.2 meters long and supported by six piers, with the tallest 154 meters. The total span of the bridge girder is 249 meters, a world record. “This Yuanjiang Bridge is more than 300 meters long from the NO. 0 pier to the closing point. To guarantee construction precision, we will use a series of new technologies, including BIM (Building Information Modeling), some GPS measuring techniques and some advanced equipment, including three-dimensional lifting jack, vertical and horizontal scanning correction devices, and so on. The use of all these new technologies and devices guarantees that the error of closing will be within 5 millimeters,” said Xie Lu, chief engineer of the fourth branch of Yuxi-Mohan railway from China Tiesiju Civil Engineering Group Co.,Ltd. Construction of the bridge started in April 2016, but the depth of the river valley and the wind speed all posed great obstacles for the job. “The main pier is supported by 35 pillars each with a diameter of 2.5 meters and a foundation as deep as 75 meters. That is to say the foundation has to be 75 meters in depth. This is a key point in our construction,” said Zhu Pinghua, chief engineer of the project department of Yuxi-Mohan railway China Tiesiju Civil Engineering Group Co.,Ltd. With the girder designed to weigh 120,000 tons and beams 21,000 tons, the girder base will support roughly 150,000 tons of weight, when there is no train traveling. In addition, the geological condition underground is very fragile. To cope with the difficulty, each two steel tubes of the girder steel structure are welded together in an X shape, a new method created by China to reduce extra weight, according to researchers. Aerial view of under-construction China-Laos railway. The railroad, using Chinese technology and equipment, is expected to turn land-locked Laos to a land-linked country. Today in VisualPolitik EN we’ll be talking about the countries that are taking off in Africa! Did you enjoy our video? Click the ‘subscribe’ button and stay tuned for our new videos every week! New subway cars designed and manufactured by a Chinese company are undergoing tests and will be ready to take passengers in Boston by the end of this year. YANGON, June 30 (Xinhua) — The 55th Myanmar Gems Emporium has concluded in Nay Pyi Taw, selling 423.118 million euros (495 million U.S. dollars) worth of 5,259 jade lots, the official Global New Light of Myanmar reported Saturday. Also, 2.598 million euros (3 million U.S. dollars) worth of 341 pearl lots and 1.379 million euros (1.6 million U.S. dollars) worth of 69 gems lots were sold under open tender system at the 10-day annual gems emporium held from June 20 to 29. Licensed and authorized buyers from both home and abroad included those from China, Thailand, Canada, Australia and the United States, of whom majority are from China. About 61 exhibition booths displayed rough jade and gems, cut and polished gemstone as well as special sale booth for pearl lots. Sponsored by the Ministry of Natural Resource and Environmental Conservation, Myanmar gems emporium has been held annually since 1964. Reds Go Green (2009): This Chinese Company have built an environmentally friendly car – but will it catch on? As a consultant in the electric vehicle and solar world i have made a video about the electric car market in China, showing the manufacturing and the EV’s in the street. Let’s face it, over the years Chinese car manufacturers weren’t associated with unique design, cutting-edge technologies and perfect build quality. However, these days seem to be long gone, especially on the all-electric sports cars market. We invite you take a look at the EVs that might soon be racing on the streets, but you never would have thought to be made in China. Enjoy the ride!